The purposes of the R.E.D. program and its server R.E.D. Server are to derive RESP or ESP charges and to build force field libraries for small molecules and molecule fragments. Data generated by R.E.D. and R.E.D. Server (charge values, Cartesian coordinates and molecular topology) are available in the Tripos mol2 file format usable as a force field library in any molecular modeling package (AMBER, CHARMM, Gromacs, etc...). R.E.DD.B. is an online database storing RESP and ESP charge values and force field libraries for small molecules and molecule fragments in the Tripos mol2 file format. This tutorial describes the use of the Tripos mol2 file format in the LEaP program available in the AmberTools. To this purpose, new commands have been implemented in LEaP and a perfect compatibility between R.E.D., R.E.DD.B. and LEaP is now observed. The complete description of these new commands is reported below along with examples. LEaP actually consists of two programs, the graphical interface xLEaP and its text mode version tLEaP. 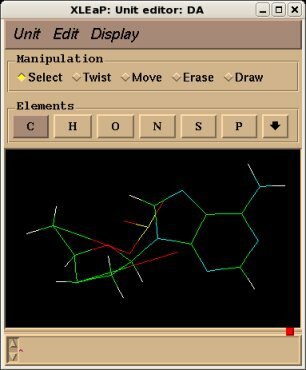 xLEaP is particularly convenient for building and displaying structures and their related information (atom and residue names, force field atom types, charge values etc...). On the contrary, tLEaP is very efficient for automatically executing scripts in a text mode. Remark: A new LEaP version (third LEaP version or non-graphical sLEaP) has been added in the AmberTools. However, the features reported in this tutorial are only effective within tLEaP and xLEaP. The commands available in xLEaP (or tLEaP) can be displayed by typing the "help" command at the prompt message (See the Figure 1 below). 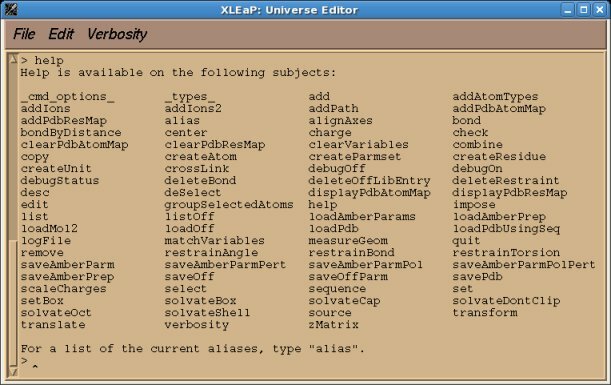 All these commands are common to xleap and tleap and thus can be executed in a text mode, i.e. they can be incorporated in scripts. xLEaP features some interesting commands too (See figure 2 below). These commands are graphical only and none of them are available in the text mode. Consequently, none of these commands can be used in a script. To solve this problem some of the commands only available in xLEaP have been incorporated in tLEaP. It is important to emphasize that before using one of these new commands, target atoms belonging to the unit have to be selected using the "select" command. 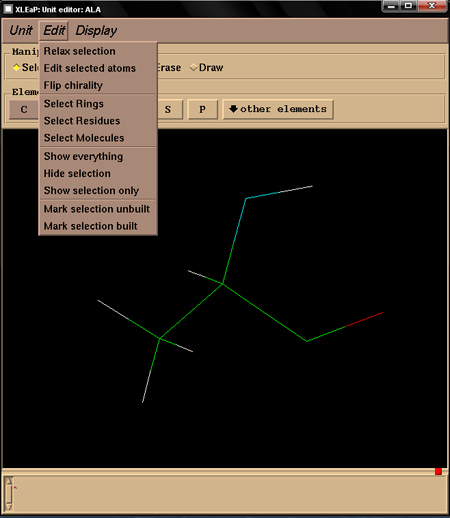 Once the relax or flip command has been executed, the selected atoms have to be de-selected with the "deselect" command. The "select" and "deselect" commands are available in tleap. The "option" will affect the sixth column of the @<TRIPOS>ATOM group. "1" will print force field dependant atom types ; if the latters are not available, chemical elements will be printed instead. The use of the "relax", "flip" and "savemol2" will be illustrated on the central fragment of the Deoxyadenosine nucleotide monophosphate, see Project F-60 for example. The corresponding mol2 file generated by the R.E.D. III.3 program is actually a bare fusion of a Dimethylphosphate and a Deoxyadenosine nucleoside without any relaxation step. The resulting structure is deformed and quite unphysical (see Figure 3a, below). Nevertheless, it has to be noted that in the philosophy of building a force field library such a feature is not a problem since the Cartesian coordinates available in a force field library are not used as a recognition motif. Indeed, a force field library has to be compatible with any type of molecular orientation and/or conformation for a given structure (this statement is also true for enantiomers or diatereoisomers). However, visualizing such a deformed structure is definitely not convenient, and submitting it as is in R.E.DD.B. is not acceptable. The "relax", "flip" and "savemol2" commands can be used in scripts to generate a Tripos mol2 file with a correct set of Cartesian coordinates. The structure corresponding to the Tripos mol2 file obtained after Cartesian coordinate corrections is presented in Figure 3b below. With the latest versions of R.E.D. the geometry described in Figure 3b can be directly generated! 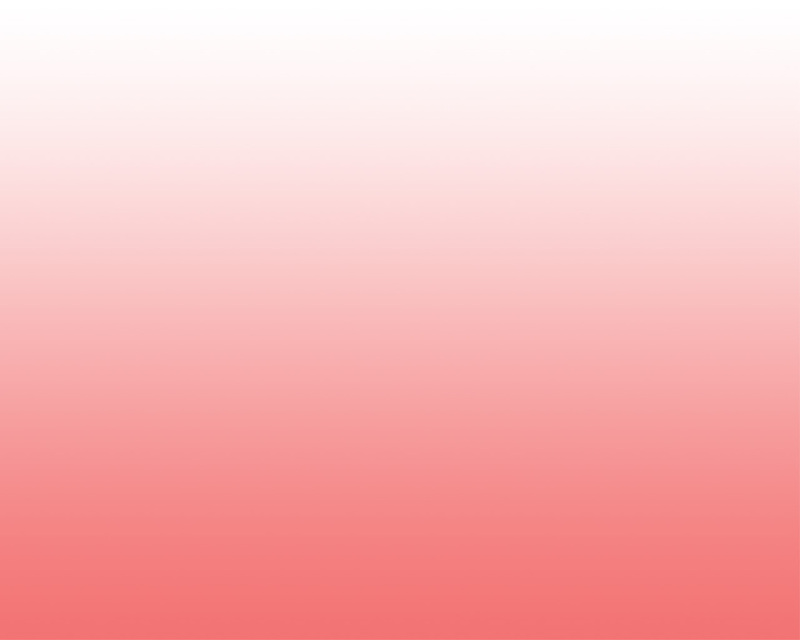 tleap -f leap-script.cmd This type of LEaP script is now useless with R.E.D. III.4 & R.E.D. IV version June 2010! - Before downloading the modified LEaP source code files requested for this tutorial, please check the LEaP license on the AMBER web site. Each user of the LEaP source code files downloaded from q4md-forcefieldtools.org have to strictly follow the license defined on the AMBER website. (i) Click here to download the modified tleap source code files. (i) Click here to download the modified LEaP source code files. Warning: The savemol2 command does not work on some Linux distributions (i. e. Ubuntu, 32 bits), leading to a crash of xLEaP and tLEaP with a "stack smashing detected" error when writing the atom description. Please, download the patch from here if you want to use the savemol2 command in the LEaP version provided with Antechamber, AMBER8 or AMBER9. - These new features are now available in the AmberTools. Users do not need to upload these files/patch anymore. Release of this tutorial: October 1st, 2007. Last update of this tutorial page: August 7th, 2011.